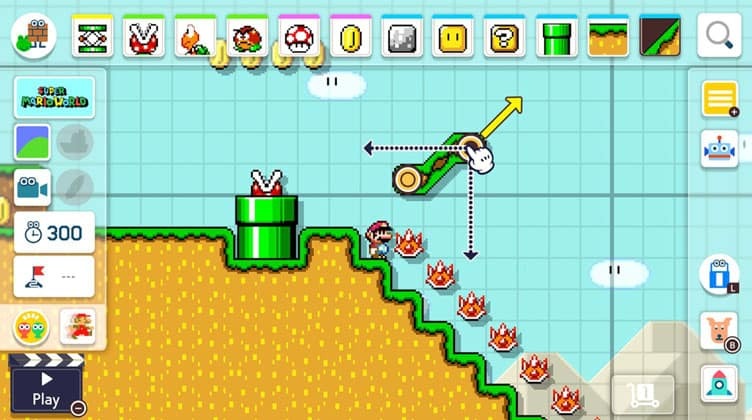 The first Super Mario Maker on Wii U allowed players to design their own levels for the first time ever. It was well received by both critics and fans for having an intuitive UI and curation system that allowed players to discover new levels and share their creations with others online. Although the game still had its shortcomings, like the lack of level checkpoints or a way to filter stages created by your friends, SMM marks a key moment in Nintendo’s history when fans were given free rein to push the limits of their imagination. Unfortunately, the game never got the time in the spotlight it deserved, mainly because of the small install base of the Wii U and the console’s short lifespan. Nintendo would later rerelease SMM on 3DS to some success, but the handheld version’s subpar level sharing functionality ultimately hindered the game from reaching its true potential. Ever since the Switch’s launch in 2017, the handheld hybrid has gone on to become home for a slew of Wii U ports like New Super Mario Bros. U Deluxe and Donkey Kong Country: Tropical Freeze, prompting fans to wonder whether or not SMM would get the ‘Deluxe’ treatment and be ported with extra content. 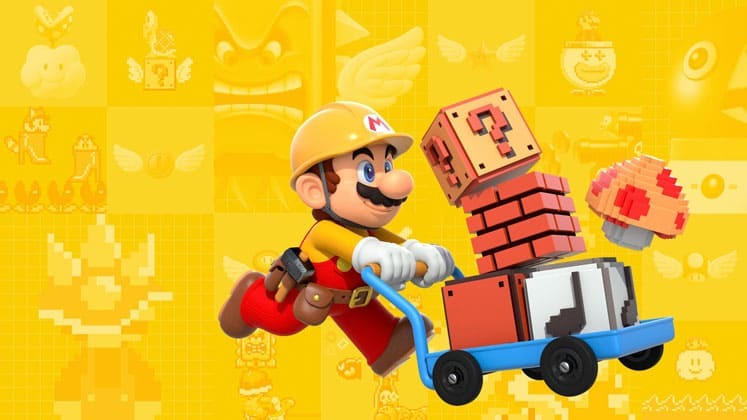 In a recent 2019 Direct, Nintendo put these rumors to bed, announcing that a sequel, Super Mario Maker 2, would be making its way to Switch later this year. While the announcement revealed a bunch of new information, there’s still some unanswered questions like how the game will manage to work with the Switch’s single screen as well as what new features will be included. So we’re here to cover everything you need to know regarding Super Mario Maker 2, make sure to check back as we’ll be updating this story in the future. Super Mario Maker 2 Gameplay – What Could Be Changed? SMM2 was revealed during a Nintendo Direct in February. 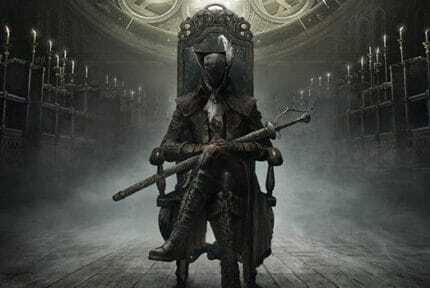 Although we still don’t have a confirmed release date, we know that the game will be launching sometime in June 2019 exclusively for Switch. While SMM is primarily known for its user-generated content, the original came bundled with some premade levels and remixes of existing Super Mario Bros. levels in addition to a ‘100 Mario Challenge’ mode which had players attempting to clear randomly generated levels with 100 lives. We can expect SMM2 to take a similar approach and include a new challenge-style campaign for players. Given that the sequel comes packed with new items and will function at least slightly differently than the Wii U game, expect to play through an extended tutorial mode that teaches you how to use the game’s creation tools. Just like the original, SMM2’s gameplay will be broken up into two categories: designing levels and playing levels. Players will be able to create their own levels and share them online with friends and strangers who can then remix those designs, adding or removing objects. You’ll also be able to simply browse through player-designed levels and offer feedback using the game’s curation tools. Slopes – Something that was lacking from the original SMM was the ability to create slopes for Mario to slide down. It seems that Nintendo has taken player feedback into consideration and included this feature for the sequel. Players will be able convert blocks into two different kinds of slopes, with one being steeper than the other. Water – You’ll be able to add water to non-water levels and create rising water levels found in Super Mario World. Scrolling Levels – Players will be able to create scrolling levels with the option of having the camera pan vertically, horizontally, or a mix of the two. This will no doubt lead to the creation of some truly sadistic level designs. Radial Menu – There have also been some changes made to the UI, with the addition of a new radial interface that allows players to choose items in set groups quickly while designing a level. Coin Counter – Levels will keep track of how many coins a player has collected. Checkpoint Flags – Allows a player to respawn at a designated checkpoint should they die before completing a level. Snake Blocks – Originally appeared in Super Mario World, these customizable platforms travel down a set path. Giant Blocks – Become bigger each time they’re hit. On/Off Blocks – Can be switched on or off, granting access to new areas. Gusts of wind – Originally appeared in Super Mario Bros.: The Lost Levels, they allow Mario to travel higher in the air. Rock Blocks – Large bricks that require multiple hits to destroy. Piranha Creeper Vines – Travel along a set path that’s fully customizable. Glass Pipes – Clear pipes that coins, fireballs, and enemies can travel through. Parachutes – Can be attached to enemies and possibly other items, causing them to fall at a slower speed. Red Yoshi – Mario is seen riding one in the trailer, it’s not known whether it has the fireball ability. ‘Cat Suit’ Bell Power-Up – Found in Super Mario 3D World, allows Mario to climb walls. Big coins – Larger coins that are worth 10 coins. Trees that can hold power-ups. 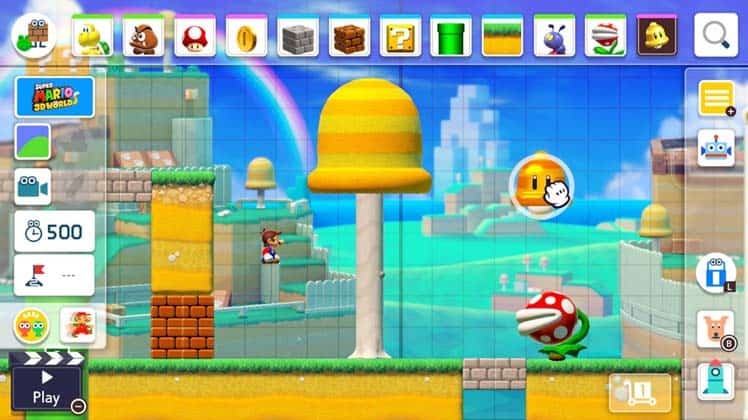 Super Mario 3D World – A new visual style that wasn’t present in the first SMM, which only included palettes from Super Mario Bros., Super Mario Bros. 3, Super Mario World, and New Super Mario Bros. U. Something that has a lot of fans excited is the possibility that SMM2 will support multiplayer. In the game’s artwork we can see Luigi standing beside Mario as well as Toad and Toadette in the level below them. This has led many to wonder if they’ll be playable characters or simply different skins for Mario. If so, this could mean character-specific level designs that make full use of each character’s special abilities, like Luigi’s fluttery jump or Toadette’s ‘Super Crown’ ability from New Super Mario Bros. U Deluxe. This also leaves room for more characters to be added down the road like Princess Peach, who we could see using her parasol to float across stages. We’d love if Nintendo decided to take things a step further and allow levels to be played with up to four players. Perhaps include a special party mode where players take turns adding elements to a level before playing through it together. Even though we’re not sure how well this would mesh with the game’s existing formula, if anyone can pull it off its Nintendo. Nintendo’s done a good job at taking feedback from fans of SMM and we’re hoping they continue to do so. Games like this depend on the strength of their community, and if players are given the tools to engage and collaborate with one another, there’s no telling how far SMM2 can go. The addition of new items from previous games has us excited for the future of the level creator and the seemingly infinite possibilities it presents. Whether that means adding more characters from the Mushroom Kingdom, or visual styles from other Super Mario titles like Paper Mario or Super Mario 64, we’re totally here for it. If you’re excited for Super Mario Maker 2, check out our list for the Best Upcoming Switch Games of 2019.